SF fans have a sort of love/hate relationship with neural implants. On the one hand, there's the fascination with having a few helpful enhancements, like the implanted sockets for microsofts that make it easy to add new skills or capabilities to the user, or the communications implant that would allow direct communication with computers. On the other hand, there's the dark side, with devices like the droud from Larry Niven's Ringworld Engineers, which offers endless, unearned ecstasy, provided for a few pennies-worth of electrical current delivered to the pleasure center of the brain. Another example would be the neural cut out that lets another person take control of your body, turning you into a mere meat puppet. Whichever your preference, there are certain technologies that must be developed before we will get any of the above. It turns out that trying to permanently installing something metallic in your brain is problematic. Rigid metal electrodes placed in the soft tissue of the brain triggers a cascade of inflammatory signals, which damages or kills neurons. Scientists at the University of Michigan are working with neural interfaces that are coated with an electrically conductive polymer to work around these problems. David Martin and his collaborators have developed a way to electrochemically deposit the polymer onto the electrode (similar to chroming a car bumper). By adding small amounts of another polymer, the conductive polymer forms a hairy texture along the metal shaft. Animal tests of cortical implants in rodents and cochlear implants--in which an electrode array is implanted into the auditory portion of the inner ear--in guinea pigs suggest that coated electrodes perform better than bare metal versions, particularly in the short term. However, it's not yet clear how they'll fare in the long term, which is one of the biggest problems facing chronic implants--especially devices that record neural activity. "Recording quality deteriorates over time with all existing electrodes," says Andrew Schwartz, a neuroscientist at the University of Pittsburgh. One approach is to grow PEDOT, an electrically conductive polymer, onto an electrode after it is surgically implanted into the body. 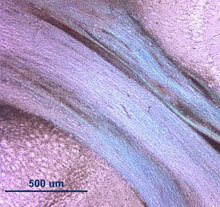 Shown here is a slice of cortical tissue from a mouse in which the polymer (shown in blue) was deposited after insertion of the metal electrode. The polymer surrounds the cells, forming a diffuse, conductive network that follows the white-matter tracts of the cortex. Another interesting development is a special polymer that can switch from rigid to flexible, potentially creating a pliable electrode. Researchers "isolated stiff cellulose fibers from the mantles of tunicates, sea creatures with skin similar to that of sea cucumbers. The researchers then combined the fibers with a rubbery polymer mixture. The fibers formed a uniform matrix throughout, reinforcing the softer polymer material." "In the stiff state, the material is like a hard, rigid plastic, much like your CD case," says Christoph Weder, professor of macromolecular science and engineering at Case Western University. "When the material becomes soft, it's more like a rubber." He says that if such a material were used to design neural electrodes, it could be engineered to respond to fluid in the brain, softening as it comes in contact with nerve tissue. Cochlear implants and deep brain stimulation are just two real-life techniques that work by stimulating nerve cells via an implanted electrode, and would require long-term implantation. From Flexible/Rigid Biopolymer Inspired By Sea Cucumbers and Growing Neural Implants: New approaches could more seamlessly integrate medical devices into the body..